She’s come a long way since ‘The Rachel’. Even though she looks barely any different from her days as Rachel Green on Friends, Jennifer Aniston actually turns 50 today. Over her career she’s become well known for perfect comic timing, a tumultuous romance with Ross Geller and, of course, her hair. In the mid-Nineties Aniston solidified herself as a hair icon with ‘The Rachel’ – her character on Friends had such an iconic ‘do that the hairstyle was actually named after her. She inspired thousands of women to adopt the haircut, including other celebs like Tyra Banks and Meg Ryan. It was definitely a high-maintenance kind of style – it had lots of layers for volume, which meant it had to be trimmed regularly and blow dried to perfection. In the late Nineties Aniston was obviously keen to leave The Rachel behind her. She did this by doing the opposite of the overly-styled look: natural, tousled waves. Not straightened or curled, this is the perfect ‘just got out of bed’ hairstyle. Most of us look back at our hairstyles from 2001 with embarrassment, but Aniston managed to keep things chic – even in the Noughties. She favoured the ultra-sleek look and bright blonde highlights for a really glamorous look. Like most of us in the Noughties, Aniston did experiment with a fringe – but she still managed to pull it off. In 2004 Friends was coming to an end, and the actor was no doubt thinking about her future career. She brought in the last series with a side parting, bangs and a darker hair colour – perhaps signalling her switch from the small to big screen. However, Aniston couldn’t stay away from blonde hair for long – soon after showing off her brunette locks she changed back to blonde highlights. Aniston really embraced the look of a California beach girl – growing out her hair and keeping it in ever-so-effortless, messy waves. 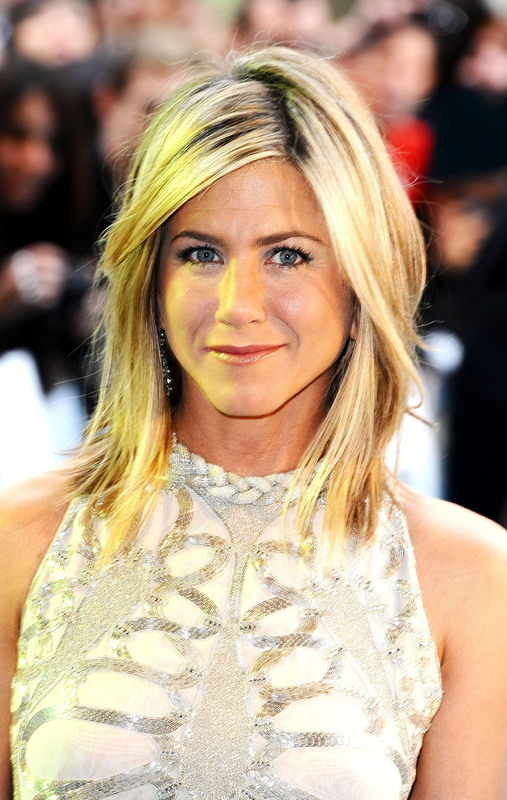 In 2011 Aniston chopped her hair off to a long bob – a lob. Keeping the bright blonde highlights, the style of cut is almost like she’s recreating The Rachel from the Nineties, but in a very modern way. It’s a lot choppier and messier, and not quite as high maintenance. In recent times, Aniston has been moving away from her signature messy-but-perfect look and embracing sleeker styles – and you can’t help but envy how shiny her locks look. The actor has also been gravitating more towards her natural brunette hair colour, which gets lighter at the ends in a subtle ombre effect.